Our office in Tom Price has moved just up the road. We are continuing to serve the Traditional Owners of the Pilbara from our new premises at lot 974 Central Road in Tom Price. All of our other contact details remain the same, and you can always reach your nearest YMAC office for free by calling 1300 7 12345. Spinifex Hill Studio’s, the first dedicated professional aboriginal arts center, opened in Port Hedland last week. Local aboriginal artists were joined by dignitaries and hundreds of people from across the Pilbara to celebrate the historic opening. For more information on the center, including opening times, click here. On 11th March 2014, the Federal Court recognised the native title rights of the Banjima People at their on-country determination held in Karijini National Park in the Central Pilbara. The Banjima People first lodged their native title claim in 1998 and have been in litigation with the WA State Government since 2011 after being unable to move forward with a negotiated outcome. Simon Hawkins, CEO for Yamatji Marlpa Aboriginal Corporation said it was a momentous occasion for the Banjima people. Indigenous Business Australia (IBA) are holding free Into Business workshops for Aboriginal and Torres Strait Islander peoples who are interested in turning a business idea into reality. Over a series of three self-paced workshops you will have the opportunity to assess whether your idea can be developed into a commercially viable business. Workshop C – financial planning and management. The Ngarla People welcome today’s High Court decision, confirming that their native title rights were not extinguished by mining leases. 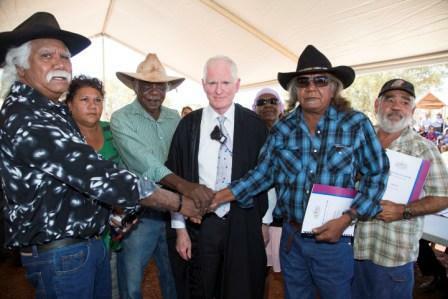 The landmark ruling by the Court dismissed arguments by the Western Australian Government that 50 year-old mining leases, granted over areas 150km east of Port Hedland, permanently extinguished all native title rights in that land. To listen to the ABC Rural interview with YMAC CEO Simon Hawkins regarding the landmark decision click here. On 11th March 2014 the Banjima people of the Central Pilbara region of WA celebrated the formal recognition under Australian Law of their cultural rights to approximately 10,200 square kilometres of traditional lands, at their on-country determination held in Karijini National Park. Watch the video commemorating this significant milestone for the Banjima people. Filed under: Aboriginal Artist, ACDC Gallery, arts, Geraldton, Midwest, Yamatji. Geraldton’s ACDC Gallery is preparing for chock-a-block year ahead. They’ve kicked things off last month with the Yamatji Arts showcase displaying brilliant work of some of the Midwest’s Aboriginal Artists. On display are paintings, baskets and beautiful decorative pieces from a wide range of artists. The Yamatji Arts showcase will be running until 15th March at the ACDC Gallery located at 33 Marine Tce in Geraldton. For more information on this and other upcoming exhibits click here to visit their facebook page.